Creating outdoor spaces is about surveying the available space, assessing the needs of the property owners and designing and installing features that will meet those needs. Many people want structures in their yards, that will allow them to make better use of the outdoor areas and most choose to get an outdoor kitchen installed. Every homeowner will have specific requirements in terms of the type of kitchen they want on their property. Some people prefer a standalone feature in a certain area of their yard, while others prefer that the structure be installed on a patio or deck - in this case it becomes an extension of the indoor areas of your home. Skilled kitchen designers will understand exactly what types of materials the client wants in the kitchen, the amount of storage space they need, types of countertops and the materials to be used in the flooring etc. It’s important to use weather-resistant materials in the work as that will increase the longevity of the structure. The outdoor kitchen design can be customized to your needs, and the company that handles this job for you will make sure that the plans, materials and design concept complements the look of your home as well as the landscape it is installed in. The designers also focus on ensuring that there is proper movement flow in the kitchen and that there is proper space for all the appliances that are to be installed there. They will also make sure there is plenty of space for seating and that the plumbing installations are planned well. Planning an outdoor kitchen isn’t a job you can entrust to a novice. A skilled and experienced designer will make sure that the structure is planned to perfection. The location has to be chosen with care and every feature needs to be designed well in order to look great and be functional. These professionals will also make sure that the outdoor kitchen plans are in line with your needs and budget. When the kitchen is built on a patio or deck, it becomes very important to maintain the design flow from the indoor areas to the yard. 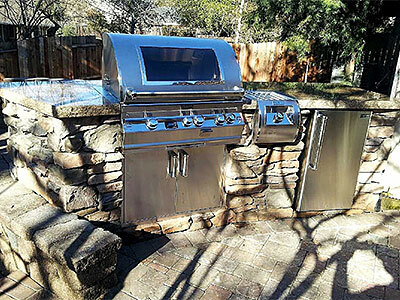 If you are planning on getting an outdoor kitchen installed on your property, you want to make sure that the company you hire would be able to provide excellent, customized solutions and this is where local companies such as LR Landscaping & Pavers come in. They will provide you excellent outdoor kitchen design and installation solutions, at a very competitive cost.